There was a strong turnout of players from the Wood River Valley and Idaho Falls for the Zenergy Extravaganza Junior Boys’ tennis tournament last weekend at Zenergy and The Valley Club, according to tour-nament director and Zenergy Peak Performance coach George Maurtua. - 18-and-under singles: Champion—Willis Sanchez-duPont (Community School). 2nd place—Kyler Hartman (Idaho Falls). 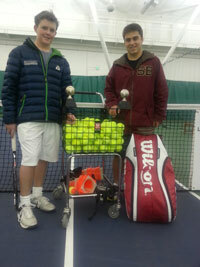 - 18-and-under doubles: Champions—Willis Sanchez-duPont and George Everitt (Community School). 2nd place—Kyler Hartman and Jaxon Montague (Idaho Falls). - 14-and-under singles: Champion—Tegan Hartman (Idaho Falls). Consolation champion—Mikel Sanchez-duPont (Community School). - 14-and-under doubles: Champions—Tegan Hartman and Jacob Brewer (Idaho Falls). 2nd place—Mikel Sanchez-duPont and William Everitt (Community School).